A book within a book about a book. A sterling homage to the grand tradition of British murder mysteries, clearly a love letter to Christie, Fleming, and Conan Doyle. Delightfully fun, wickedly deceiving. A little protracted at some points but made all the worth it by the final act. Magpie Murders by Anthony Horowitz is a treat for lovers of mystery. Structured quite differently than most books, Mr. Horowitz treats his readers to a double feature: a full-length novel within the novel, which I personally found to be more engrossing than the story about the novel. Confused? I was a little bit too. It took me a little longer than I’d like to admit to figure out that everything in this story is, in fact, fiction. But Mr. Horowitz does such a wonderful job of pulling you into both stories that you have very little time to ruminate on this fact. No detail of this book is overlooked, right down to the page numbers, and the care with which it was edited shows that everyone involved – from writer, to editor, to publisher, and everyone in between – was fully invested in this work. 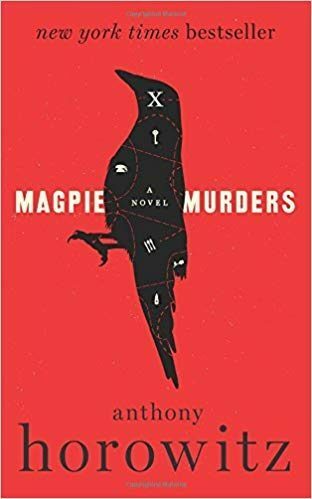 With characters that you immediately root for (or against), twists and turns enough to make you dizzy, and an easy, fast pace, Magpie Murders wins on all accounts. If you are looking for a more subtle, understated and truly fantastic mystery, this book is for you.